It is widely acknowledged that information technology will revolutionise organisational life. And yet if you look at most organisations you will find that the pace of change is slow and that there is not much sign of a revolution. In many organisations expensive equipment seems to be making very little contribution to the goals of the enterprise. It seems that suppliers are always in the midst of editing new technological breakthroughs whilst potential user organisations are still trying to assimilate yesterday’s technology. The pace of technological development poses the end user with the perpetual headache of trying to decide what is worth using and how to use it. 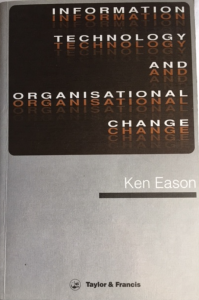 Ken wrote – of nearly twenty years as one of the founders of the HUSAT research centre, I have been working with my colleagues to understand the difficulties people encounter when trying to harness information technology and then to build tools and techniques which will help them in the process. As information has advanced the methodologies and tools for technical systems design have become progressively more sophisticated and efficient. By contrast the techniques by which uses can specify their needs, evaluate alternatives, implement systems, make complementary organisational changes etc. have hardly progressed at all. Most design methodologies pay scant attention to these issues. It is almost a truism to say that we need socio-technical systems design; the joint design of the technical and social sub-systems in the organisation. However, many forces keep the two processes apart. Technical design is the province of technologists who know little of social system design. Technical tools do not address this issue.Organisational change is the province of management but is seen as separate from technical change and ether are few tools to help the fusion of the two kinds of change. EASON, K.D. Information Technology and Organisational Change, (1988) Taylor & Francis, London.